Caring about your business relationships is something we truly understand. Whether it is our delicious Vermont Buttercrunch Toffee or luscious Lemon Lulu cake and the variety of chocolate truffles, caramels and gift baskets, there is a gift from Mother Myrick's that will inspire "thank you" from all your gift recipients. 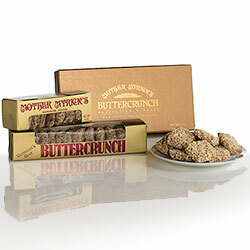 Vermont's Best Buttercrunch A delicious way to say "Thank You!" 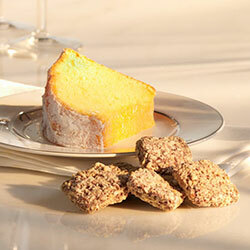 Our memorable buttercrunch is crisp and buttery. Each toffee center, made with Vermont Cabot Creamery butter, is dipped in premium milk or dark chocolate, and then rolled in freshly roasted cashews and almonds. Each bite just melts in your mouth. 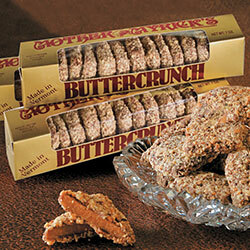 Join the growing number of satisfied companies who thank their customers with Mother Myrick's Buttercrunch! Contact me for pricing, samples and other information.